One of Ireland's most famous attractions, the Blarney Stone is housed in Blarney Castle, which is not far from the cruise port at Cobh. However, the Stone and the castle are not all there is to see. 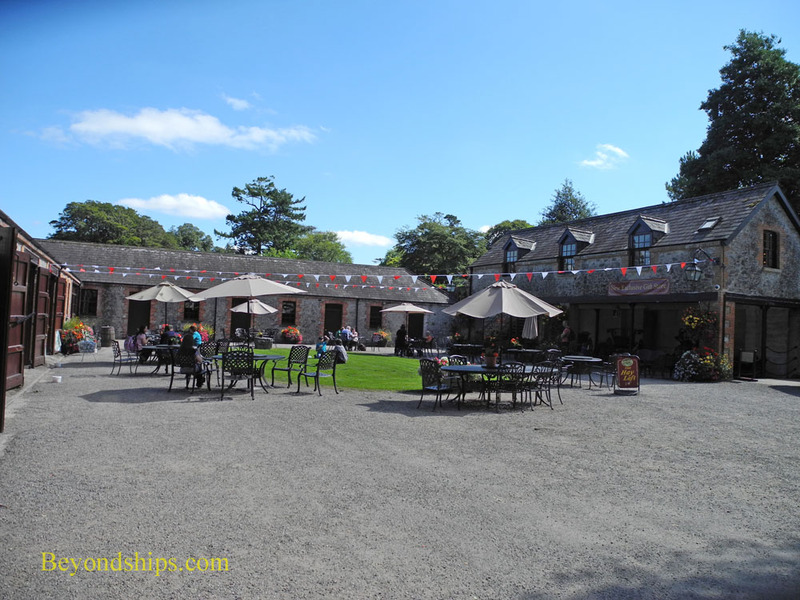 On the grounds are a 19th century stately mansion, gardens and beautifully landscaped grounds. The first structure to be built on this site was a wooden fortress in 1200 A.D. This was replaced shortly afterward with a stone castle. However, that castle was taken down in order to build a new castle in about 1446. The third castle was built by Dermont MacCarthy, King of Munster. The MacCarthys continued to occupy the castle until 1646 when during the Irish Confederate Wars, it was taken by English Parliamentarian forces under Lord Broghill. Following the restoration of King Charles II to the British throne, the castle was returned to the MacCarthy's. But it was only for a relatively short time. The MacCarthy's backed King James II in his struggle for the throne with William of Orange. When William prevailed, the castle was confiscated. After changing hands a number of time, the castle was purchased by Sir James St. John Jefferyes in 1704. The Jeffreyes married with the Colhurst family in the 19th century and the Colthusts continue to own the property to this day. The castle is essentially a ruin. 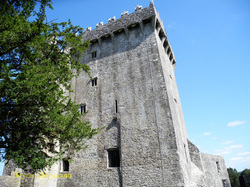 Its major surviving feature is the rectangular stone keep where the Blarney Stone resides. According to legend, the Blarney Stone is part of the Stone of Scone or Stone of Destiny upon which the Kings of Scotland are crowned. Supposedly, it came to Blarney because the MacCarthy's supplied 5,000 soldiers to fight along side Robert the Bruce at the Battle of Bannockburn, which ended with the defeat of the English King Edward II The Scottish king was so grateful, that he gave the Stone to the MacCarthy's. The Stone is said to give those who kiss it, the gift of a form of eloquence. This form of eloquence was first observed in Cormac Teige MacCarthy in 1602. MacCarthy was being pressured by the English to swear allegiance to Queen Elizabeth I and turn over legal title to his lands to the crown. However, MacCarthy would respond by protesting that it was his intention to do that but with a mixture of flattery, excuses and stories, he would explain that it could not be done just yet. So nothing ever happened. After reading yet another of MacCarthy's answers, Queen Elizabeth allegedly exclaimed: "This is all Blarney; what he says he never means!" 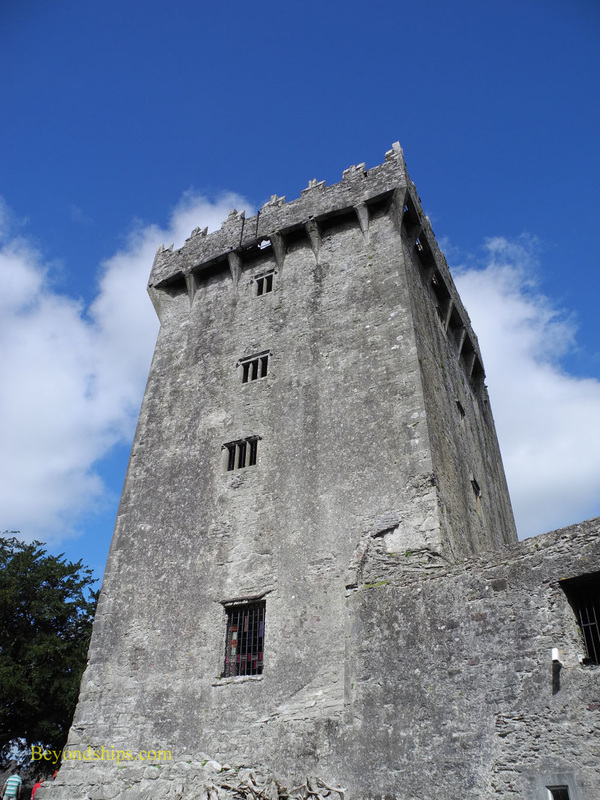 It is not easy to kiss the Blarney Stone. You have to climb up some 100 steps to the top of Barney Castle. 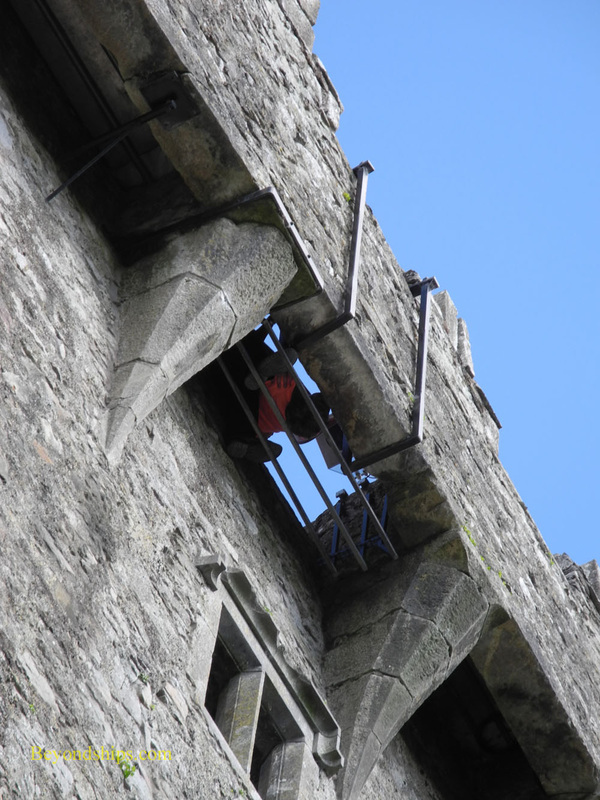 Then holding onto two metal rails, you lean over backwards, lower yourself through the battlements head-first so that you are dangling above the ground, seemingly miles below. The Stone is on the underside of the battlement. A castle employee holds on to you during this ritual. Somewhat surprisingly, there are often long lines to do this despite the height and awkward position. Also on the estate is a stately mansion. Essentially, a smaller version of Downtown Abby, the house is still occupied by the owner Sir Charles Colthurst. After the Jeffreyes purchased the property, they built a mansion adjoining the castle. However, this house was destroyed by fire in 1820. Subsequently, the new house was built on an elevated spot some distance from the Castle. 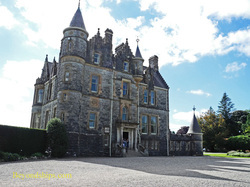 The house was designed by Sir Thomas Lanyon and was built in the Scottish Baronial style. It looks quite Gothic, which was quite popular in the mid-19th century. Inside the most striking feature is the large oak staircase. However, the rooms are done in an elegant and refined way. Furthermore, the house is a living home, not a museum, thus making it more interesting to view. There is an additional charge to view Blarney House and it is by guided tour only. The grounds of the estate are covered in gardens. Next to the castle is the Poison Garden, complete with signs warning visitors not to touch or even smell the plants. The Rock Close that seeks to evoke a mystical atmosphere of Druids, witches and fairies. There is also a Fern Garden. Adding more visual interest to the grounds are the ruins of various old out buildings. The former stable area has been converted into a restaurant (above). 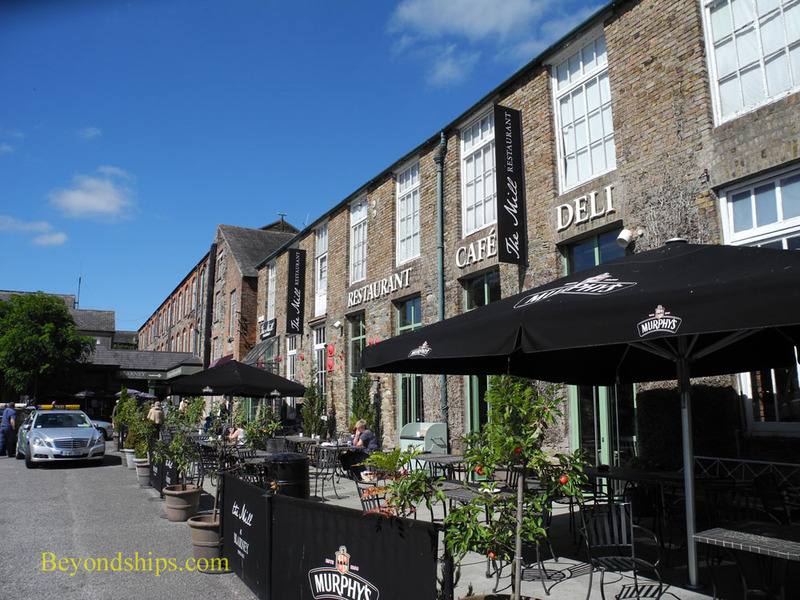 In addition, just outside the gates is the Blarney Woolen Mill with shops, cafes and a hotel in converted factory buildings (right).